I don't think there is a name for this dish, I call it my vegetarian pasta, and it is so easy to make. Is there a recipe in a book for it, i don't know, I once made it and my family loved it and this is soemthing I make often. Generous portion of paemsan cheese grated. Add the oil in a pan and fry the onions and garlic, add chillie flakes, then add the tomatoes and a bit more water . Add parsly, basil leaves, salt and peper and cook for 15 minutes. Boil pasta in the mean time and serve the sauce on top of pasta . Sprinle also generous portion of graed parmesan..
That is it and we jus tlove this. Nice recipe,i still buy ready made sauce for pasta,will have to try this out! Yummy Pasta, I love Olives in anything. Great lunch, simple and elegant. I wanted to make Pesto Pasta last weekend, didn't have the time. Saw "Ironman 2" y'day, not bad at all, S would enjoy it. A very delicious veggie pasta! Pictures look great too! I can finish that plate immediately, truly tempting.. I'm going to try your nice and quick pasta! My dear, you have a puttanesca sauce...just minus the anchovies. A light meal when it get's too hot to spend time in the kitchen. Delicious mouth watering pasta dish. Simple and delicious. I will give the olives a miss though. 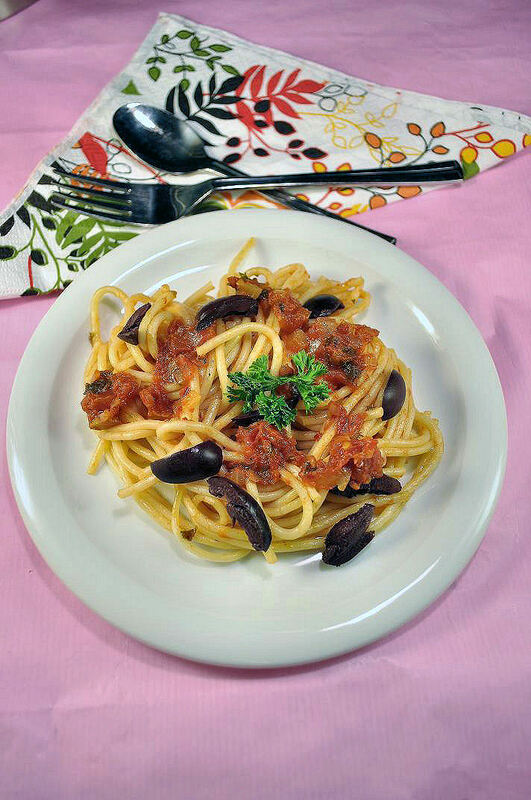 Very yummy pasta with olives! Simple and delicious vegetarian dish. I like it. Nothing beat the simplicity of this pasta. I like it! That's a great recipe. I have one such quick cooking recipe that I reach for when am pressed for time. Delicious !! Very quick dish with very less ingredients! The pict are quiet tempting! Ahhh I love olives in pasta. Lovely click happy cook. You just combined two of my favorite foods: olives and tomatoes! I could eat these on bread, pasta, rice, whatever! This is super easy and delicious!! Simple, delicious and healthy. What else would anyone want from a dish? Sometimes the simple and quick pasta dishes are the best. This looks delish! A simple yet tasty pasta...would love to have it for dinner! Yum..love the pasta..and its vegetarian too,making it all the more tempting!! How simple - my daughter must really love this. finla very nice recipe,lovely pic. I love simple and delicious pasta dishes like this. Such simple flavors, but one of the best dishes! Fast post, fast dish, fast explanation and spot on! A lovely & very tasty easy dish! 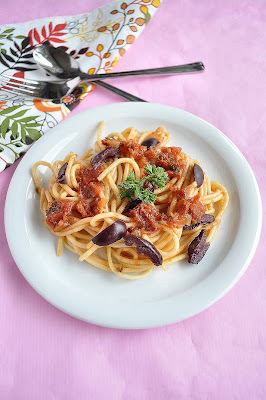 nice recipe with olives..wish you had made this before and send it for my event..
Wow this can be cooked in no time.. I love pasta and your click is so tempting. This is so simple and healthy. I usually use green olives in my pastas but never black ones. This is a must try for me. Healthy and delicious looking pasta. Love olives in them. tomatoes, olives and pasta all in one? okay, this is surely my kind of dish :) looks so tempting. Nice! Love your page! I know you on Apolina's page. 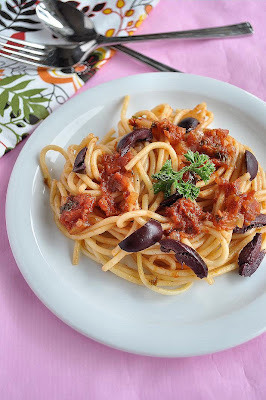 It seems to be "sauce al arrabiata" with olives. Simple but really tasty. Thnaks for your nice recipes. Looks so yummy n inviting !! Beautiful clicks too !! What a simple and healthy pasta dish! Quite similar to the sauce used in Jamie Oliver's meatballs and pasta recipe. Love it! Thankyou all for the comments, try them, it is so easy to make but really delicous.